YOU ARE HERE:Home » Auto Insurance » Senior Drivers: When Do You Hand Over the Keys? As baby boomers begin approaching their 70’s, senior drivers will be dominating Florida roadways. State officials estimate by 2030, one in four Florida drivers will be 65 or older. “It is important for senior drivers to maintain their driving independence, but at some point elderly drivers and their family must have the difficult conversation about when driving capabilities are beginning to diminish, causing potential danger for others on the road and themselves,” said Ellsworth Buck, Vice President of GreatFlorida Insurance. Unfortunately, senior drivers fear losing their independence and push the limits- Florida currently leads the country in elderly driver deaths. Liberty Mutual recently conducted a survey of 1,000 adults 75 and older. In the past six months 78 percent reported driving regularly even after reporting declining physical abilities such as slow reaction times, tiring easily, difficulty hearing or seeing or getting lost or confused while driving. While most seniors would consider limiting or stopping their driving is presented with the right reason, most are apprehensive about the idea of life without driving. Concerns that may prevent seniors from giving up their keys included losing independence, becoming less active, difficulty finding alternative forms of transportation and feeling isolated. So when do you know it is time to have that awkward discussion with your spouse, family member, friend or self? AARP has some warning signs that indicate a person should begin to limit or stop driving. Finding dents and scrapes on the car, fences, mailboxes, garage door, curbs, etc. The Florida Department of Highway Safety and Motor Vehicles, (DHS&MV), requires that drivers age 79 or older who renew their license undergo a basic vision test. A re-examination may be given based on a change in the driver’s physical or mental condition as well as their driving record. A family member, doctor or law enforcement officer can recommend a re-exam with immunity from civil and criminal liability. The most common condition the DMV finds to restrict a license is due to vision and cognitive skills including memory, coordination and flexibility. GreatFlorida Insurance understands not everyone has a perfect driving record and is willing to work with every situation and every age to ensure your safety on the road. We offer affordable auto insurance rates and you can reach us any time, any day of the year. 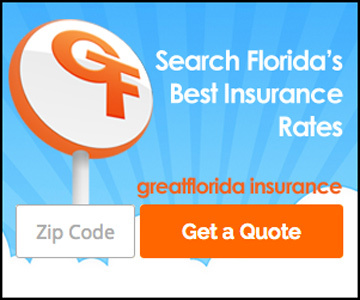 Call us at 1-888-478-7801 or go online to www.greatflorida.com for a free quote.